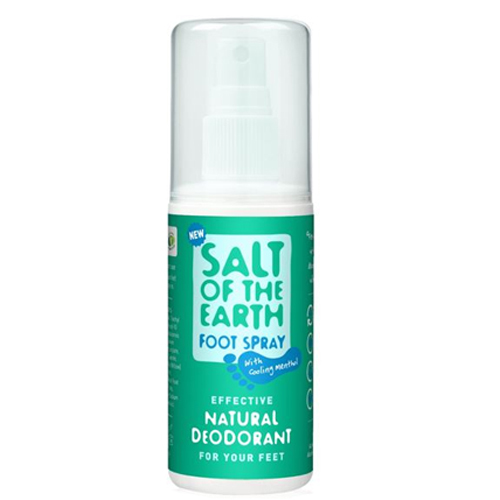 Salt of the Earth Foot Deodorant is a unisex spray, containing skin-soothing aloe vera and cooling menthol, it offers long-lasting, effective protection from foot odour – perfect for those who spend a lot of time on their feet! Whether you spend long days on your feet at work or home Salt of the Earth Effective Natural Foot Deodorant will keep you feeling fresh, cool and odour-free until you are ready to kick off your shoes and relax. There are more sweat glands in our feet than anywhere else in our body (each foot containing around 250,000 sweat glands). Sweating is our body’s natural air conditioning system, which kicks into overdrive when we are too warm. It’s also a natural way for our body to dispose of toxins, so it has an important role to play, no matter how inconvenient it is. Sweat itself is actually odourless, but when it comes into contact with bacteria, which is naturally present on our skin, it can start to smell bad. Moisture is bacteria’s best friend and anything that locks in moisture, such as socks and shoes, provides the perfect environment for bacteria to grow and multiply, which can lead to bad smelling feet if not stopped. Wash your feet – It sounds simple and obvious but washing your feet every day can make a big difference when trying to control foot odour. Use an antibacterial or antifungal soap and don’t forget to wash between your toes – this is a favourite place for bacteria to hide. Dry them – Once washed, make sure you dry them thoroughly, and again don’t forget between the toes! You can also sprinkle talcum powder all over your feet to help absorb any extra moisture. Trim your toenails and keep them clean – Under the nail bed is a great place for bacteria to grow. A regular pedicure could be more than just a pampering treat; it can be great for preventing smelly feet too! Remove hard skin – Damp, hard skin provides another great place for bacteria to thrive. Use the Salt of the Earth Foot Spray – Once clean, you can help keep your feet fresh with a foot spray. Some people use antiperspirants (the ones you use for underarms!) to keep their feet dry and odour free. While this can work, it’s important to remember that perspiration is a natural process, which antiperspirants suppress. Aqua, Propanediol, Triethyl Citrate, Polyglyceryl-10 Laurate, Aloe Barbadensis Leaf Juice, Sodium Caproyl/Lauroyl Lactylate, Polyglyceryl-2 Caprate, Menthol, Salix Nigra (Willow) Bark Extract, Leuconostoc/Radish Root Ferment Filtrate, Sclerotium Gum, Sodium Anisate, Citric Acid. Spray on clean, dry feet and massage in. Below are reviews of Salt of the Earth Natural Foot Deodorant - 100ml by bodykind customers. If you have tried this product we'd love to hear what you think so please leave a review. 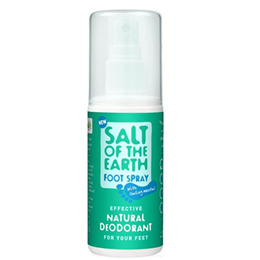 Salt of the Earth Foot Deodorant is a unisex spray, containing skin-soothing aloe vera and cooling menthol, it offers long-lasting, effective protection from foot odour - perfect for those who spend a lot of time on their feet!